Location: Approximately 40m from junction with High Street, at end of building line, rear faces St. Johns Street. The present, apparently C18 and C19 public house is actually an agglomeration of three properties, each with a distinct external character. The public house was first the centre one and has grown into those on either side, into the right hand one since listing in 1974. The right hand house is a late C16 continuous jetty house, and the centre one probably is also but the evidence here is more fragmentary. Both these were then extensively altered and refurbished in the C18 and again in the C19 when the shopfronts were added. The left hand section appears to be wholly of the C19 and later, with considerable rebuilding in the late C20. This street is now called Flannel Street after the principal late medieval product of Abergavenny, but, at the time of Archdeacon Coxe's visit in 1801 it was called Butchers' Row. The butchers' shops in the street, one of which still remains, tended to be open fronted until the Victorian period with the necessary adaptation of C16 buildings. Half of the street, which once went through to Castle Street, was demolished by the Abergavenny Improvement Commissioners in the mid C19 and the Victorian improvements to these shops probably followed on from this. The building is in three clearly defined sections, but is wholly rendered and painted on the street elevations, with natural slate roofs and brick stacks, the west end elevation is red brick. Right section is C18 in appearance but is only single depth plan. Two storeys, three windows over a late C19 shopfront with recessed central entrance and 2-light display windows with timber mullion on either side; coved fascia with pedimented stops at either end. The windows above are 3 over 3 pane sashes with a modern casement between. Plain steeply pitched roof with rebuilt red brick stack to right gable. Left section has double depth plan, two storeys, two windows. The ground floor has a tripartite sash window with 2 over 2 panes flanked by 1 over 1, and a doorway to right. The first floor has 2 over 2 pane sash windows. Low pitch roof without stack. Partly rebuilt red brick walling to left return. The section in front of the right hand section facing Flannel Street is a separate premises, and has C19 shopfronts. Centre section has a first floor splayed oriel with 2 over 2 pane sashes flanked by 1 over 1. Below this is a horned tripartite sash with a plain doorway to the right. Low pitch roof with late C20 feature of unknown use, possibly ventilation. Right section is a lower building with three storeys with single window to top (2-light) and first floor (blocked), and doorway with attached broad 3-light window on ground floor. To right of this a two-storey building at the west corner has been much altered and rebuilt. Right-hand section shows clear evidence of the first jettied build. It is of single depth plan with a blind stone rear wall backing onto the house in St. Johns Street. The present street front has been projected beyond the jettied one so the first floor must be carried on an RSJ. Four massive boxed in cross-beams carry the first floor and the jetty post survives in the right corner. Victorian fireplace and tiled floor. Upper floors not seen but they are said to retain C19 fireplaces etc. Left hand section has been more altered and is difficult to interpret. Listed for special interest as an C18 and C19 public house which incorporates fabric from two C16 houses and retains a good C19 shopfront. In Abergavenny town centre just to the west of the High Street. Situated opposite the Town Hall on the main commercial street which runs from south-east to north-west across Abergavenny. 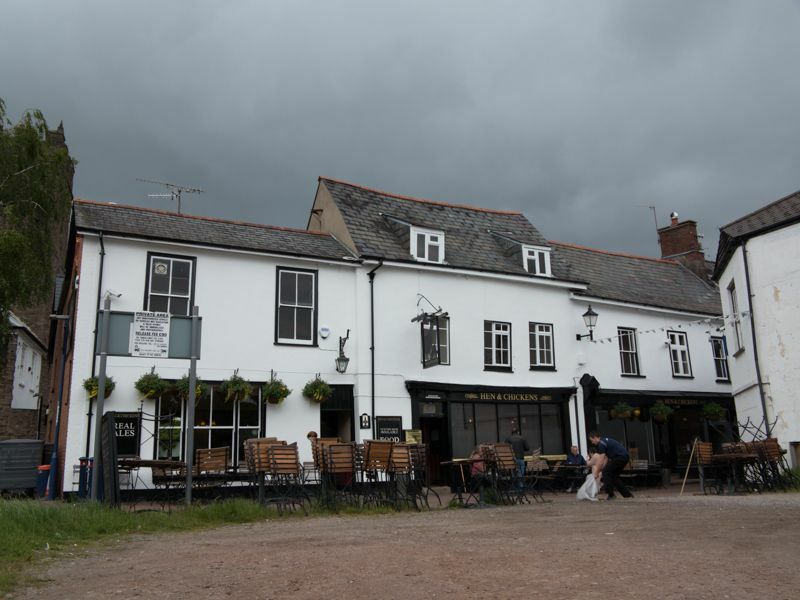 Situated on the main commercial street which runs from south-east to north-west across Abergavenny. On the corner of High street and Market Street, situated on the main commercial street which runs from south-east to north-west across Abergavenny. S part of a group of historic buildings between St John's Lane and St John's Square in the centre of Abergavenny.